SHERI FINK is the author of the New York Times bestselling book, Five Days at Memorial: Life and Death in a Storm-Ravaged Hospital (Crown, 2013) about choices made in the aftermath of Hurricane Katrina. She is a correspondent at the New York Times, where her and her colleagues' stories on the West Africa Ebola crisis were recognized with the 2015 Pulitzer Prize for international reporting, the George Polk Award for health reporting, and the Overseas Press Club Hal Boyle Award. Her story "The Deadly Choices at Memorial," co-published by ProPublica and the New York Times Magazine, received a 2010 Pulitzer Prize for investigative reporting and a National Magazine Award for reporting. A former relief worker in disaster and conflict zones, Fink received her M.D. and Ph.D. from Stanford University. Her first book, War Hospital: A True Story of Surgery and Survival (PublicAffairs), is about medical professionals under siege during the genocide in Srebrenica, Bosnia-Herzegovina. 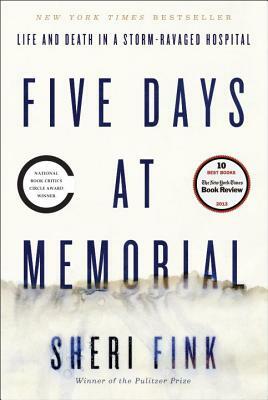 Five Days at Memorial was the winner of the National Book Critics Circle Award for nonfiction, the PEN/John Kenneth Galbraith Award for nonfiction, the Ridenhour Book Prize, the J. Anthony Lukas Book Prize, the Los Angeles Times Book Prize, the Southern Independent Booksellers Alliance Book Award, the American Medical Writers Association Medical Book Award, and the NASW Science in Society Journalism Book Award.